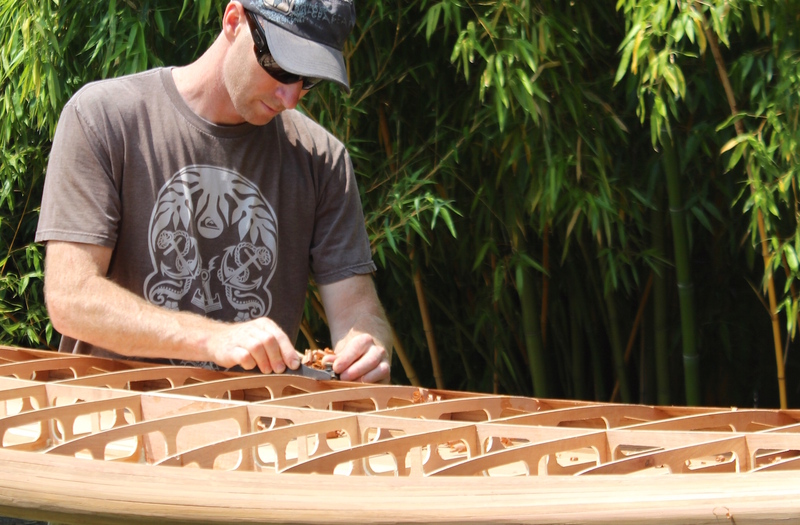 "Thousands of wooden SUP enthusiast have followed these tutorials and become wooden SUP builders." Living in the Pacific Northwest, Western Red Cedar is my favourite wood to use but any softwood can potentially be used. The weight of the wood is the most important factor in deciding the wood species because the torsion box construction is very strong. Epoxy and a single layer of 4-ounce fibreglass cloth is used to seal the wood. The finished board looks much harder to build than it really is since almost all of the milling is straight. The only curved milling is for the solid blocking at the nose and tail and these pieces are rough cut and then hand shaped on the board. 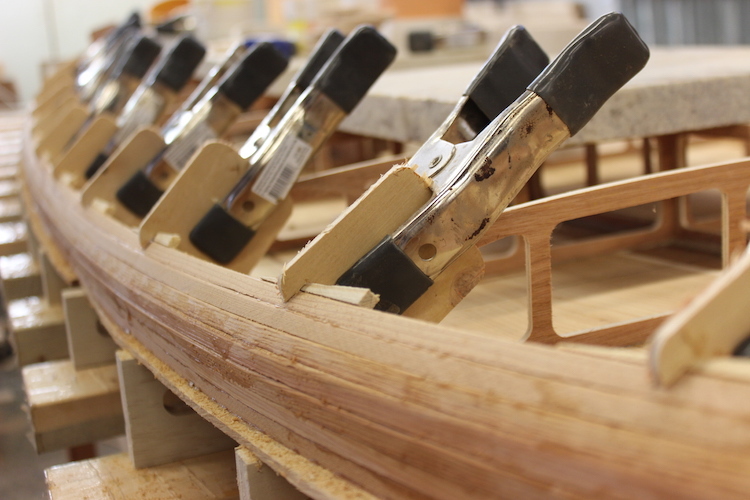 The use of thin materials allows for the wood to bend into the complex curves you see on the finished boards. One of the great things about this style of building is the top and bottom are built as large panels before they are attached to the board. These panels can be built on a flat surface making perfect joinery fairly simple. Layout mark are added to the panels while they are still a basic rectangle. These marks are used to keep everything symmetrical ensuring the board is straight and true. The excess material is removed before the panel is attached to the fishbone allowing inexpensive clamps to be used while building the rails. 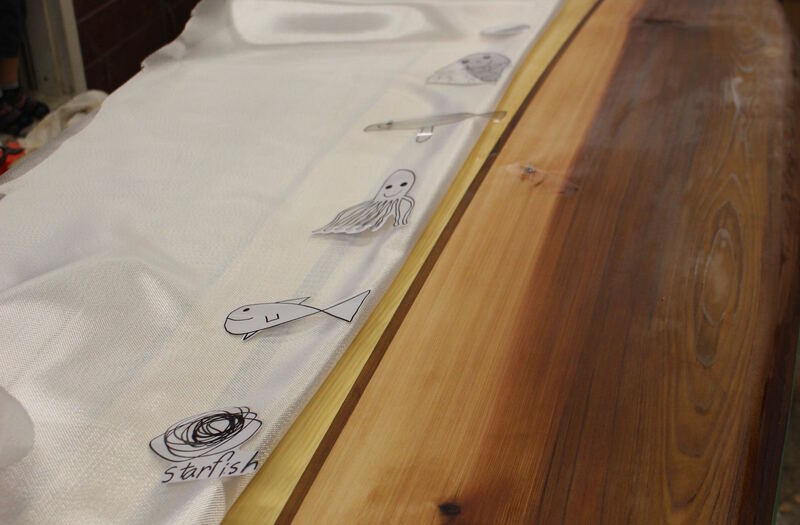 The internal fishbone skeleton defines the finished shape of the board and does the majority of the shaping. The builder just has to wrap the fishbone perimeter in cedar to achieve the correct shape. 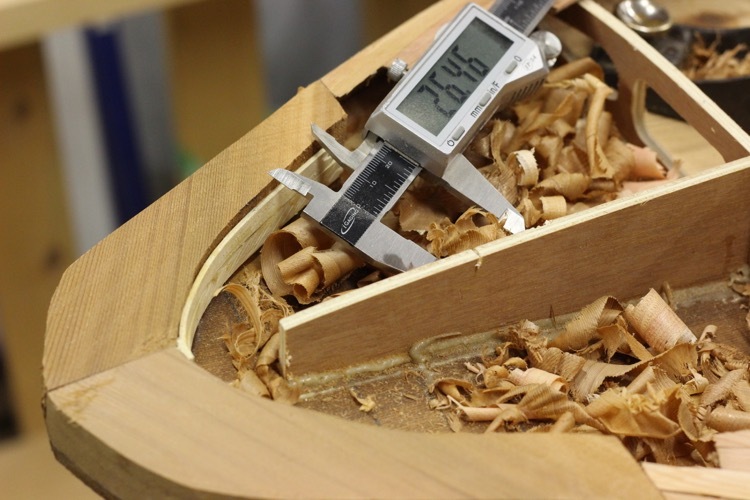 Unlike shaping a foam board, you start a wood board with the finished shape already defined. The rails are the only part of the board where wood is added one strip at a time. The use of very narrow pieces allows for the complex curves to be follow easily. 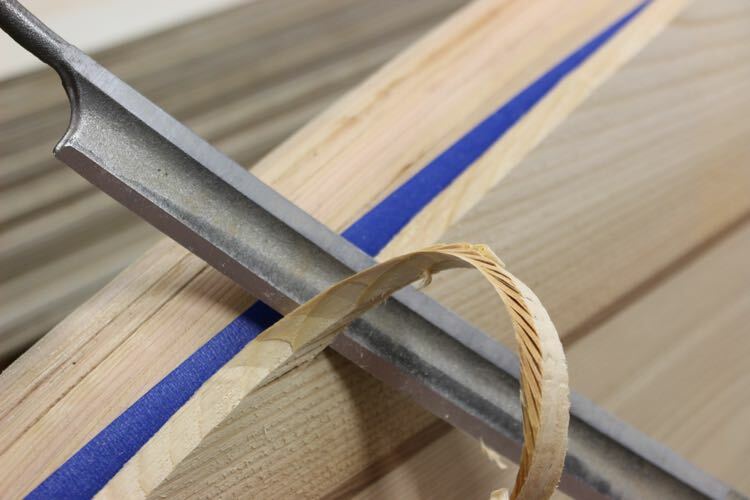 The strips are half the height used on canoes and kayaks (1/4 x 3/8) so they bend easily and require very little steam. 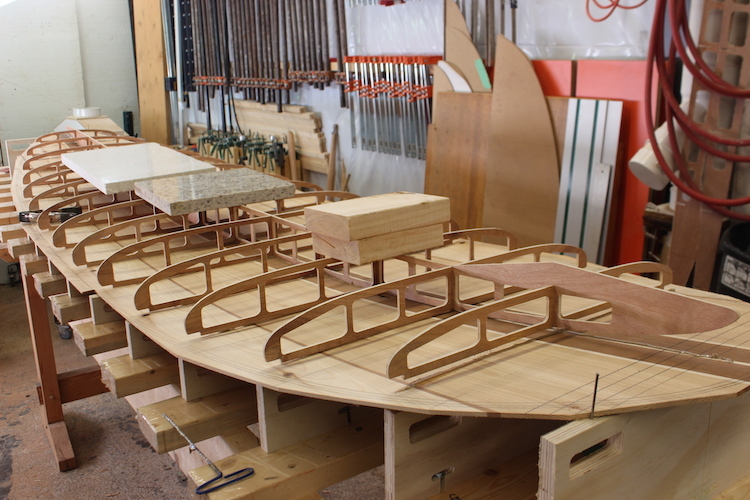 Solid blocking is added at the nose and tail eliminating the need to make tight radius bends. This blocking also adds ascetically pleasing ends where the board is most likely to be bumped. 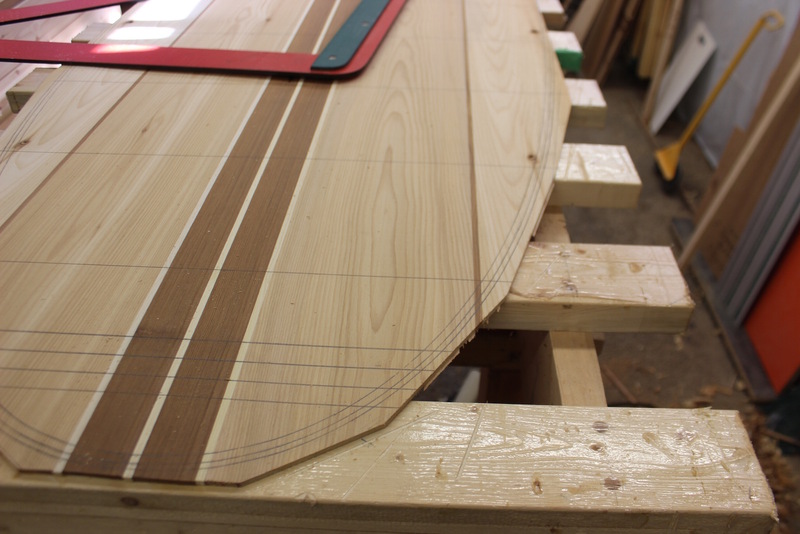 The fishbone skeleton does most of the shaping so this step basically fairing the curves smoothing the transitions from rails to the top and bottom panels. 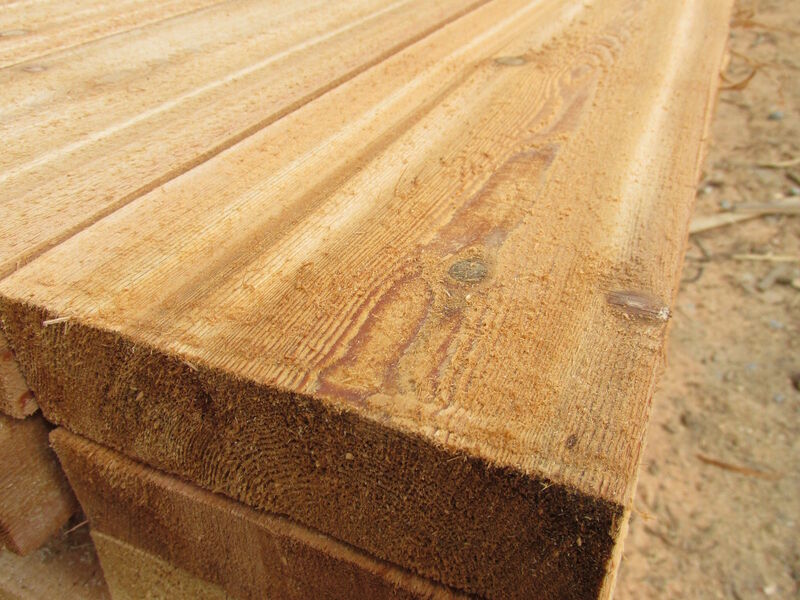 The transition from the rails to the top panel is feathered resulting in an outer skin that is never more than 1/4 inch thick. The top is installed as a single piece. 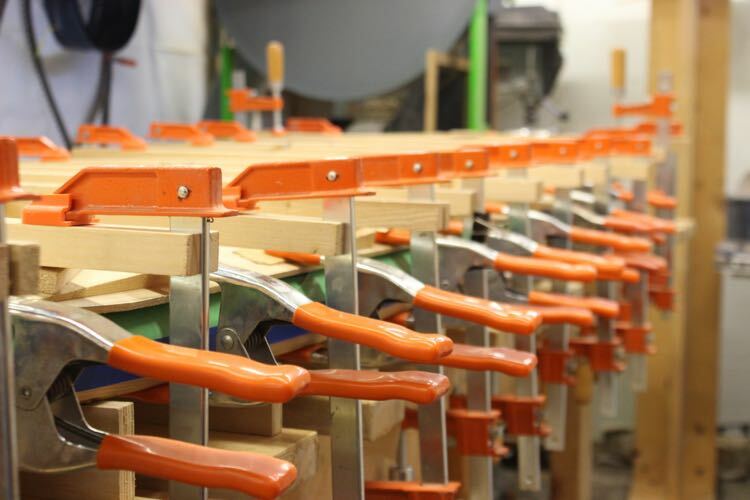 There are ways to complete this step without using clamps as homemade wedges are doing all the work in this picture. 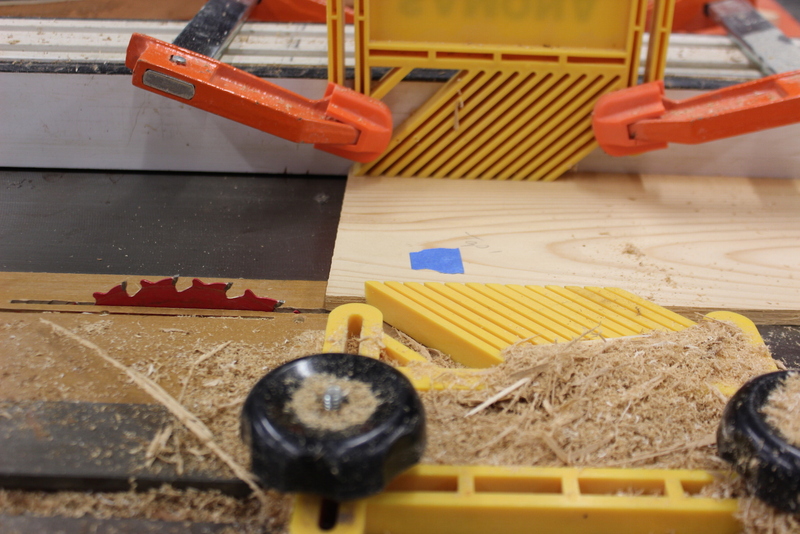 The final woodworking step is to remove the excess material from the top panel. Painters tape is used to mark the location of the top of the rail simplifying this step. 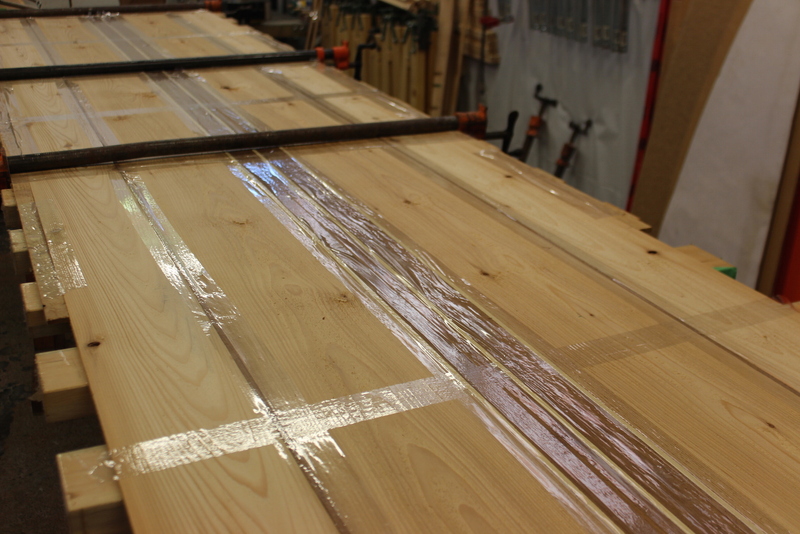 With the excess material removed the whole board is sanded to get ready for glassing. Personal touches can be added under the glass to make your board truly special. The wood is sealed under a single layer of 4 ounce fiberglass with environmentally responsible epoxy resin. 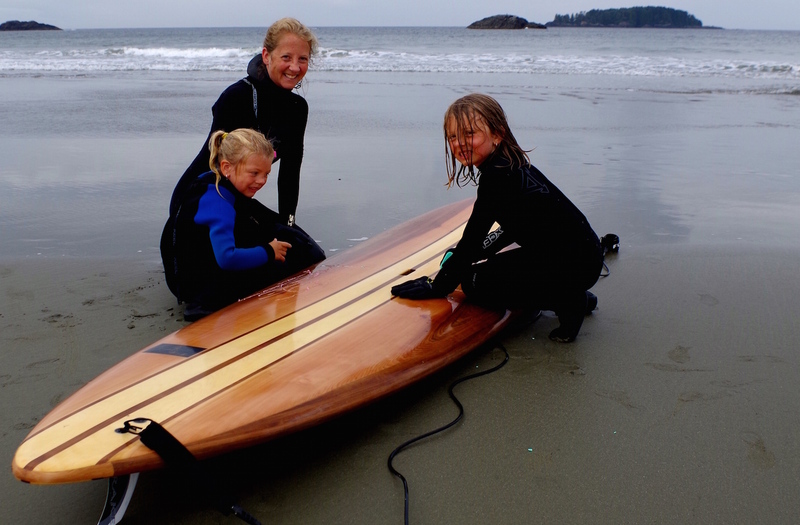 Paddling your completed board promises simple joy and happiness for a lifetime.